On March 1, 2016, Jan Walker will depart Oceanside, CA and run across the US to the Pentagon 9/11 Memorial in Washington DC, garnering grass roots support to make this Trail a reality. 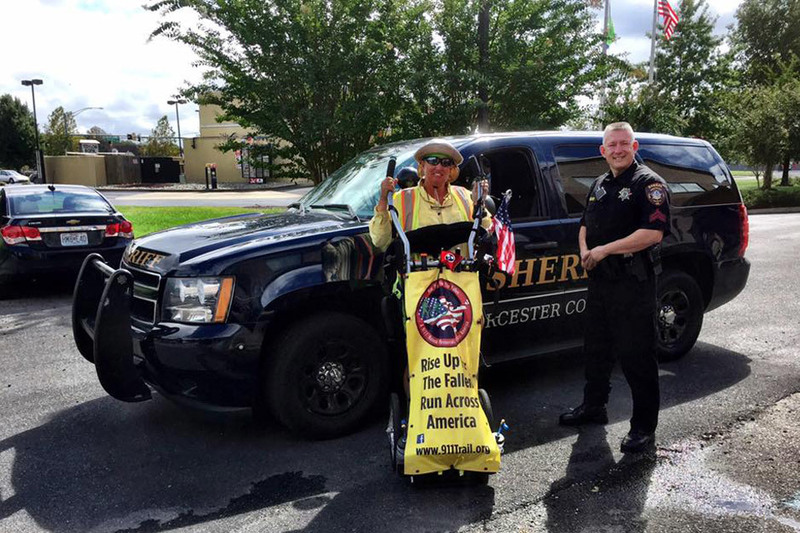 Along the way, she will be stopping at local 9/11 Memorials, garnering media support and donations for The 9/11 National Memorial Trail Alliance. They are a 501(c)3 non-profit, working to establish a National Memorial Trail (a multi-use run, hike, bike trail) connecting the three 9/11 Memorial crash sites. It would be the first of it's kind in the US, as there currently are no federally designated "National Memorial" Trails in existence. When it's finished, it will be an approximately 1100 mile long triangle shaped route linking the Pentagon Memorial, Flight 93 Memorial in Shanksville, PA, and the National September 11 Memorial in New York City. Currently about 2/3rds of the Trail is set. We are honored she will be using the Wheelie Walking Trailer while completing the approximately 3000 mile Run for this worthy cause.